Its not often I get excited about speaker stands. Lets face it they are not the sexiest piece of kit out there. They don't make noise, they don't have flashing lights or dials and sliders you can fiddle with... they just sit there with all the drool worthy stuff sat on top. Back at the start of the year our very own Tom found himself embedded deep in NAMM and one of his battle stories involved a set of speaker stands which had blown him away. I must admit I only kind of half paid attention in a holiday photo slideshow sort of way at this point because as I said before... speaker stands. Are they really that interesting? This week we finally managed to get some in stock and as it happens I'm in the process of a studio switch around and I've been considering some of the Isolation Pads for sitting my Genelecs on as we've had them out for demo days and I've been impressed by how they tighten up the sound reproduction in day to day use, especially on a budget as they come in at around £30. After a sit down with Tom I got a swift talking too and told to go and purchase some of the Iso Acoustics L8R155 speaker stands instead. But I replied they cost almost 3 times as much... will they really prove an effective solution and give me the claimed improvements? "Yes, just get them, you won't be disappointed"
Now I'm always wary of this type of thing, the are so many solutions out there that at best could be considered snake oil... but having trust in Tom's choice to track down the supplier and get them in after a demo in a distant show hall, I took the plunge. Now as you may have guessed by this point, I was slightly impressed. In fact feel free to go through my other posts on here and you'll probably see this is about as excited as I get when commenting on a product. (yeah, I still can't believe it either). Going back a number of years I had a dedicated recording area in a large rectangular room and I had my speakers at the time (a pair of Sprit Absolute 2's) set up to fire straight down the room. The speakers were certainly in the budget end of the market and the was certainly a fair few compromises as to the design and overall sound of them, but I knew them well and I could finish projects in a few days on them no problem which translated onto other systems well enough that I was happy as were the people I was doing work for at the time. At some point I got lucky on a great deal on a smaller pair of Genelecs (1029's for you speaker spotters out there) which I picked up to replace my Sprits and the difference in clarity between the two price points was astounding. The problem was due to the small size of the speakers I had to add a sub for the work I was doing as I really needed the bass extension and this started to get a bit troublesome in the space I had. A few months later just as I was getting used to this new combination I had to relocate into a smaller, squarer and more boxy room and so began a number of years of fighting with the acoustics as sub placement in there is awkward at best. I've set all the speakers on bricks and concrete slabs to help reduce vibration, bass trapped all the corners, built diffusion panels on all the reflection points and hung up the traditional soft furnishings which admittedly has helped greatly but the has been something not quite right with the set up and sometimes on a busy mix it all gets a bit too much. So I fitted the speaker stands a few days ago and it was I have to say an instant improvement. On busy tracks the percussion and high end simply snaps sharply into place again, the lower mid becomes solid and easier to work with and the bass rounds itself out. For the first time in a couple of years I feel like I'm hearing the speakers properly again and I'm finding myself just sitting and listening to my collection, once more picking out parts of tracks I didn't realise were there. I've honestly spent the last few months lusting after a number of different speakers, after having A/B'd them in the office and hearing clear yet heavyweight audio coming from them and wishing my studio setup was half as good... Yet I just couldn't bring myself to spend the same amount again on another pair when I had what were known to be a fairly decent set in their heyday. For a 20th of the amount I was looking to spend on a new speaker set, these stands have sorted out my sound in a way I couldn't imagine they would, which in turn is giving me inspiration to get back in the studio and just make some noise and have fun with it. So what makes them special? Just a simple well thought out design. The base of the unit has 4 rubber sink holes that the poles go into which have a matching design at the other end. 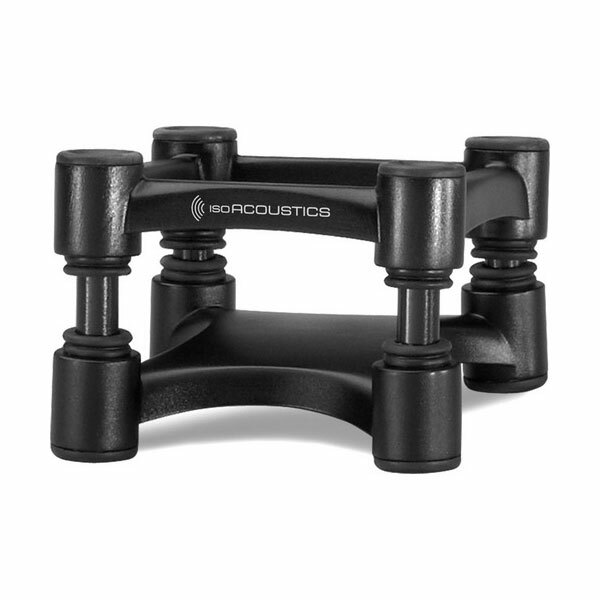 These rubber mount points allow the poles to shock absorb the vibrations caused by speaker as the cone movement causes the unit to travel and stops reverberation from being amplified by the desk and furniture in the room. That's it, a simple yet very effective design and if I'm honest the design principle isn't a million miles away from the way firms like Noctura use rubber mounting grommets to isolate their fans from the PC case to also ensure that the vibrations are being minimized. What you don't always realize is just how much your furniture can add to the acoustics in a room in a negative fashions especially if you have a small amount of space and have to desk mount your monitor solution. I knew I had a problem but up until this point I wasn't quite aware of just how much this issue was affecting my work flow and I'm quite happy I've found a working solution to this all too common a problem. I can now completely see why they took a best in show award. Never has something like this made such a difference to my setup and its probably the most effective upgrade to my mixing space since I bass trapped the troublesome corners and my only regret at this point is that they don't do a giant one to mount my sub on! Edit: ISO now do a larger L8R200 stand as well, suitable for larger speakers, up to 8" cones.